Organizations – whether they be businesses, financial institutions, government bodies or non-governmental organizations (NGOs) – have to cope with a broad range of demands. These may be caused by increasingly complex regulation, pressure to perform, ethical imperatives, cultural differences, ecological demands or societal aspirations. 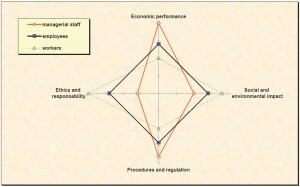 All these affect staff attitudes, perceptions and expectations, and hence may create stresses within the organization, whose efficiency and reputation will depend on its ability to harmonize these attitudes, perceptions and expectations – and this in turn means having an organizational culture based on shared values. (1) Diagnosing the culture: In many organizations – especially those in the service sector – a growing number of staff are in direct contact with the general public, and hence may do things for which the entire organization is liable. This has potential but also risks, as boards of management are only too aware. MIND THE GAP identifies gaps between what the organization says it is doing and how this is actually perceived by the people working within it. By pointing out how the culture and values projected by the organization differ from the attitudes and expectations of its staff, it reveals where change is most urgently needed. (2) Understanding and maintaining commitment among both senior and general staff: Many organizations nowadays suffer from a lack of commitment among their staff. Some studies suggest that as many as two thirds of general staff now feel less committed to their organizations. At the other extreme, some senior staff are over-committed – their whole lives seem to revolve around the organization. Organizations have the means to influence staff commitment not only through management style, but also through the culture and values they project. MIND THE GAP can help organizations identify the reasons for both under- and over-commitment among their staff. (3) Responding to current ethical challenges: At a time when ethics and societal responsibility are becoming increasingly important, few organizations are able to find out what their staff demand and expect of them in this regard. An organizational culture based on clear ethical concepts reduces the risk of people doing things that are ethically dubious. MIND THE GAP can help organizations identify their staff’s ethical perceptions, attitudes and expectations. 2. Assessment of gaps and risks: by analysing similarities and differences between attitudes and perceptions, MIND THE GAP provides a reliable picture of the existing gaps. This diagnosis can then be used to identify risks and potential. 3. Identification of relevant groups within the organization: MIND THE GAP can also be applied to groups of staff, and can then identify gaps between them. 4. Presentation and findings: Once the analysis has been completed, the diagnosis is presented to those in charge of the organization in a manner agreed in advance. This can then be used to launch a dialogue between the various partners in the organization and those responsible for the assessment, in order to investigate the reasons for the gaps and consider ways to reduce them. This will be only be done if the organization decides to proceed in the light of the findings.